Got my custom length Whiteline front end links, so I had a little fun with cinder blocks. Easiest way to adjust the swaybar end links I’ve found. 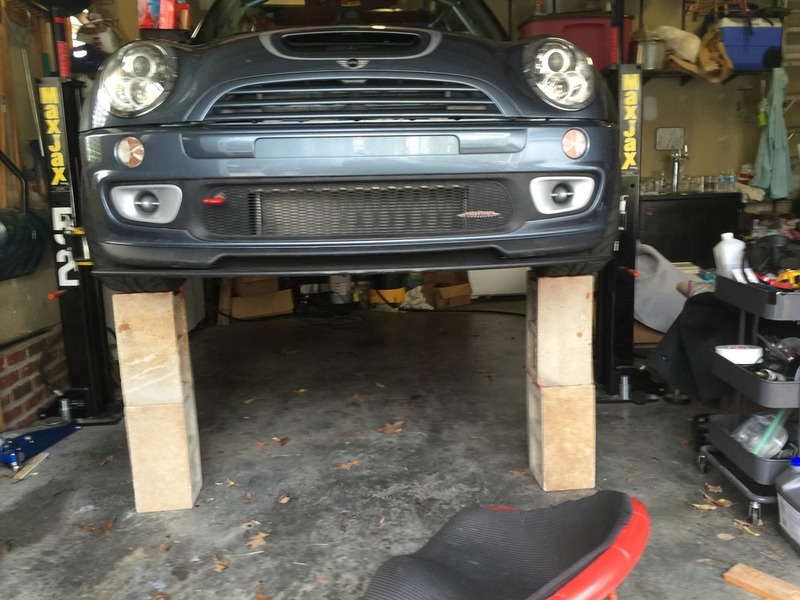 Lowered the car on the lift until the weight of the front wheels was fully on the blocks, with the lift a few mm below the jack pads. Adjust end link length until no load on swaybar. Lift car, move blocks to the back tires, lower and repeat. Then raise the car back up and lock down all the locknuts. Done. Super fast and easy. And the car rides MUCH better with the pre-load gone. Noticeably less harsh. Huge improvement. No, I wouldn’t trust my life just to blocks stacked that way. The lift had my back.